$345.00 KSI (Red Sports International) Physical Culture badge, 1925 - 1930 issue. One of the earliest Soviet sports awards established soon after the creation of the USSR. A very interesting piece in excellent condition, complete with original screw plate. $750.00 Ready for Labor and Defense, Unit Banner Award, 1931-1936. Huge and beautiful decoration awarded to sports teams of enterprises, schools etc. In fine to very fine condition. $95.00 Excellence in Physical Culture badge, screw back type, unnumbered, circa 1960s. Extremely well-made piece in very fine to excellent condition. Includes original screw plate. $125.00 Excellence in Physical Culture badge, pin back version, #15306, circa late 1950s. Extremely well-made piece in very fine to excellent condition. Includes original screw plate. $80.00 Ready for Labor and Defense, 1st level badge, 1940 - 1946. In very fine condition. Comes with a scarce original screw plate, serial numbered and mint marked. $20.00 Ready for Labor and Defense badge, 2nd level, unnumbered version, circa late 1950s through 1961. In very fine to excellent condition, and includes original mint marked screw plate. $30.00 GTO (Ready for Labor and Defense), 1st level badge, 1946 - 1961 type, circa late 1940s- early 50s. $15.00 GTO (Ready for Labor and Defense), 1st level badge, 1946 - 1961 type, circa late 1950s. $15.00 GTO 1st level badge, 1961-1972. $20.00 Excellence in GTO, 1st level badge, 1961-1972. $20.00 Excellence in GTO, 2nd level badge, 1961-1972. $29.00 BGTO (Be Ready for Labor and Defense) Youth Physical Fitness Badge, Leningrad Mint version, 1961 - 1972. Excellent condition. $25.00 BGTO (Be Ready for Labor and Defense) Youth Physical Fitness Badge, 1961 - 1972. Excellent condition. $1,200.00 First Spartakiada of the USSR, participant's badge, 1928. Beautiful, stunning piece in hallmarked silver. In superb condition and includes original hallmarked wing nut. $20.00 Spartakiada (Sports Tournament) of the Nations of the USSR, 1956, commemorative badge. Excellent condition. $110.00 Spartakiada of the Nations of the USSR, 1956, Referee's Badge. Very large and well made breast ID badge issued only to the refs at the 1956 Nations of the USSR tournament. In excellent condition. $15.00 Second Spartakiada (Sports Tournament) of the Nations of the USSR, 1959,	commemorative badge. $40.00 Spartakiada (Sports Competition) Dedicated to the 40th Anniversary of VLKSM, participant's badge, 1958. $330.00 First Spartakiada (Sports Tournament) of VTsPS, participant's badge, 1932. In excellent condition and includes original screw plate. $125.00 Second All-Union Spartakiada (Sports Tournament) of the Trade Unions, 1935, participant's badge. Screw back version in very fine condition. $45.00 Sixth Spartakiada of the Trade Unions of the USSR, Referee's Badge, 1958. Excellent condition. $30.00 Seventh Spartakiada of the Trade Unions of the USSR, participant's badge, 1961. Excellent condition. $20.00 Spartakiada of the Nations of RSFSR, 1959, participant's or spectator's badge. In excellent condition. $35.00 Spartakiada of Estonian SSR, participant's badge, 1956. Excellent condition . $40.00 Spartakiada (Sports Tournament) of the Kaunas Medical Institute, participant's badge, circa 1950s-60s. $25.00 Friendship Cup Sports Tournament at the Riga Medical Institute, participant's badge, circa 1980s. $30.00 Second Spartakiada of Ukrainian SSR, participant's badge, 1959. $75.00 Badge of a Champion of a Regional Competition in Pentathlon, Ukrainian SSR, 1958. In outstanding condition. $20.00 Sixth Spartakiada of Belorussian SSR, participant's badge, 1975. Excellent condition. $75.00 Table Medal Commemorating the 60th Anniversary of the Dinamo (Sports Club of the Soviet Law Enforcement). A limited edition medal in Bronze struck at the Leningrad Mint in 1983. In Bronze. Features bas-relief of Felix Dzerzhinsky. $35.00 First Degree in Parachute Sports, qualification badge, 1970s-80s. $2.00 Military Sportsman badge, 1st cl., 1966 type, late 1960s - 80s. In excellent condition. $20.00 Sportsman, 3rd cl. badge, late 1950s - 1964. Well made badge in brass and enamels. $22.00 Sportsman, 3rd cl. badge, pin back variation, late 1950s - 1964. In very fine to excellent condition. $135.00 Parachutist-Sportsman, 3rd class, 1940s-50s. Very fine condition. To see other Soviet Airborne Badges currently in stock, please visit "Soviet Airborne Badges" in our "Soviet Badges" section. $115.00 Lesgaft State Institute of Physical Culture (GDOIFK), graduate badge, circa 1970s. Very fine condition. 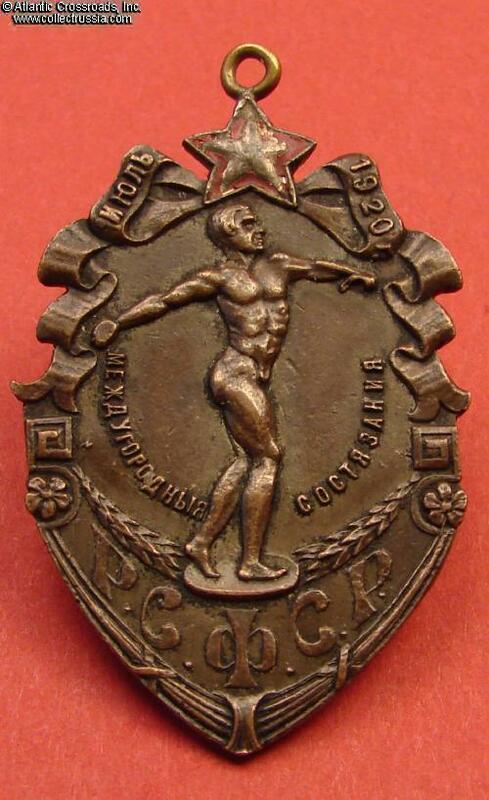 $120.00 State Central Order of Lenin Institute of Physical Culture (GTsOLIFK), graduate badge, circa 1950s-60s. $75.00 Badge of an Activist of the Volunteer Sports Society of VTsSPS (All-Union Central Council of Trade Unions), riveted early version, circa 1960s. $80.00 All-Union Student Sports Tournament of 1951, participant's badge. $15.00 Young Activist of Sports badge, circa 1950s-60s. $125.00 Soviet Award Trophy, with hand painted Gymnast on the front. Circa 1950s.